As human–wildlife interactions increase, range riders test novel strategies for keeping herds safe in the presence of threatened predators. November 28, 2017 — Editor’s note: This story was produced in collaboration with the Food & Environment Reporting Network, a non-profit investigative news organization. In the predawn chill a range rider moves through the sage grass and lupine. The scene — a woman on horseback, her cattle dog trailing behind her under a sky shockingly full of stars, and a quiet herd grazing between the aspens — is what Westerns are made of. But she is wise to not be lulled into the cowboy poetry of this place. In the Tom Miner Basin of Montana, just outside the protected wilds of Yellowstone National Park, survival requires vigilance. The 30-square-mile (80-square-kilometer) basin is home to not only a wolf pack, but also one of the densest populations of grizzly bears in the Lower 48. 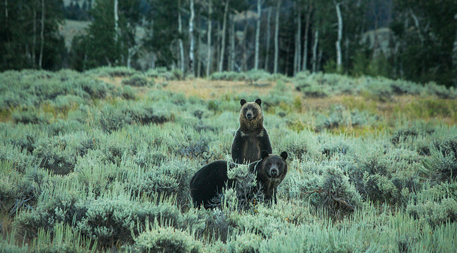 Some 30 to 40 adult bears live in the aspen-fringed draws and fir-studded peaks that weave through the area. Each summer, tourists park their cars on the side of the road to watch the animals dig for caraway roots in the cow pastures. Local residents carry cans of capsaicin-laced bear spray the way cautious urbanites pack mace. And ranchers on the upper basin’s five cattle ranches must be constantly alert. Earlier this year, a mother grizzly protecting her cubs mauled another range rider, fleeing only after the rider’s companion emptied two cans of bear spray into the air. The cattle are under even more threat than the humans: So far in Montana in 2017, 78 cows have been killed by grizzlies, and 49 more by wolves. 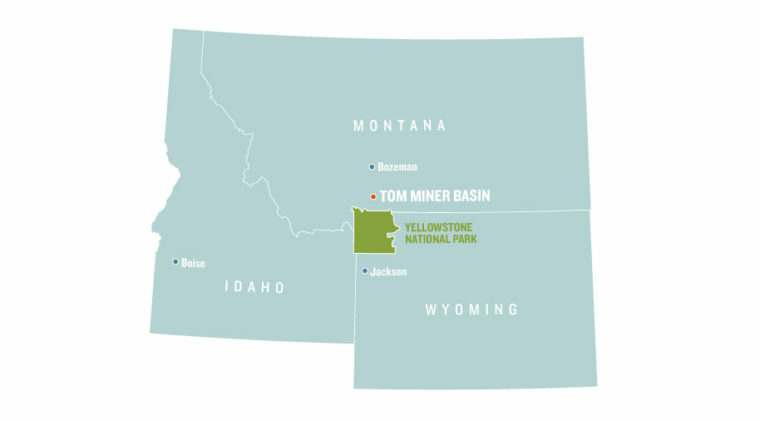 Yet the Tom Miner Basin has become a model for what conservationists call “predator coexistence”: the art of sharing the landscape with threatened meat-eaters like bears and wolves. At a time when habitat is decreasing and government protection is increasingly precarious, the ranchers here have decided to make space for their erstwhile enemies, because they believe they deserve to be here too. The effort to coexist grew more urgent after the U.S. Department of the Interior announced in June that it would remove the grizzly in the Greater Yellowstone Ecosystem — an area bordering the park that spans parts of Idaho, Wyoming and Montana — from the endangered species list, opening the door for hunting the bears outside the park. The decision is already sticky with lawsuits from environmental groups that claim that Ursus horribilis remains threatened by climate change and the loss of several of its staple foods. They fear that, without federal protection, there will be fewer regulatory obstacles to shooting bears when they wander onto private lands. But as the court cases proceed, the bears’ immediate fate may depend in part on how willing ranchers are to changing their practices in ways that protect both bears and cattle. It’s an experiment that’s transforming not only how people relate to predators, but how ranchers ranch. Malou Anderson-Ramirez remembers when the wolves began roaming out from Yellowstone into Tom Miner soon after they were reintroduced into the park in 1995. Then, about 10 or 15 years ago, the grizzlies started appearing in greater numbers, too. It was a pivotal moment for the basin’s cattle families, hers included, which suddenly had to contend with predators eyeing their calves from the hills. Anderson-Ramirez, along with her parents and siblings, custom-graze around 300 beef cattle on the family property for another Montana ranch. The number of livestock killed every year varies widely, depending on whether any of the local predators have taken a liking to beef. Most remain satisfied with wild game. But some years are especially bad — as in 2013, when a male grizzly killed nine cows in two-and-a-half weeks on a Tom Miner ranch. If a wolf or a bear kills a cow, it becomes a marked animal. That said, bears — especially females— typically are given several strikes before they’re euthanized because their reproductive rate is low, and it can take decades for the population to recover if it begins to dip. Still, the greatest cause of nonnatural death for both wolves and grizzly bears in the West is a run-in with humans, often over livestock. In 2015, for example, a record 54 grizzlies were killed by humans in the Yellowstone ecosystem, largely due to conflicts with hunters and ranchers. But the Anderson family, and some others in the basin, recognize that these top predators are only acting the way they were born to act. Instead of killing them for following their instincts, they asked, why not reduce the cattle’s vulnerability? 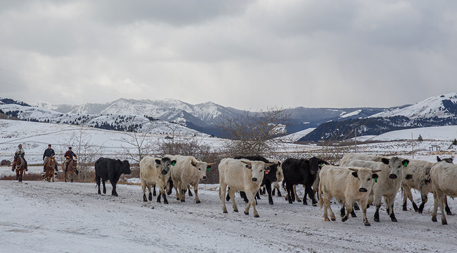 Most ranchers scatter their herds across the range for weeks or months at a time, leaving the cows to fend for themselves until it’s time to load them onto trailers and ship them to a feedlot. In 2013, Anderson-Ramirez’s sister-in-law, Hilary Zaranek-Anderson, started the basin’s range riding program, hiring a few riders every summer to patrol the area’s herds. “The objective is very simple,” Anderson-Ramirez says. 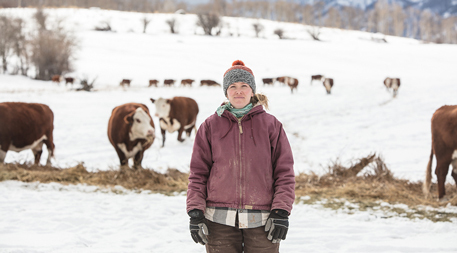 “You go out and check cattle.” Today, both women manage the program with the goal of minimizing livestock kills, but also helping ranchers stay more attuned to the health of their animals by relaying back information about the herd. During the day range riders might deter attacks, since simply having a human around could make predators look elsewhere for a meal. But most attacks happen in the middle of the night, when range riders aren’t there. So every morning and evening, when the riders in Tom Miner inspect cows, they use a relatively rare technique called low-stress livestock handling to encourage the cattle to behave more like the bison that used to graze these lands and knew to guard their young. A scattered herd is vulnerable to predation: Isolated animals are more likely to run if ambushed by a wolf or bear, making them an easier target than if they bunched together. So the range riders gently urge mothers to pair up with their calves and stick close to the rest of the herd. The low-stress part? Rather than driving a herd hard from behind, the way most cowhands do, they walk or ride in zig-zags so the cows can always see them out of the corner of their eye. As soon as the herd starts to move in the right direction, the riders stop nagging. All of which riles the cows up and makes life harder for the humans that have to work with them. Low-stress livestock handling enables a single range rider or rancher working alone to rekindle the herd instinct in a herd of hundreds without employing any of the aggressive tactics often used on ranches. And most importantly for ranchers in predator country, calm cows want to stay close to the group and are less likely to draw the attention of predators because they aren’t bawling anxiously. Low-stress-handling proponents argue that keeping animals in a peaceful state of mind improves their health, their ability to gain weight and the quality of their meat. About 5 percent of the average beef carcass is discarded at slaughter because it’s bruised from rough handling when the animal was alive, a loss that costs the industry millions of dollars a year. Despite benefits for both rancher and cow, low-stress livestock handling in its purest form is rarely practiced. And when cows are tightly grouped and grazing intensively in an area for a short period of time, their hooves work dung and urine into the ground, bury seeds, and break through crusted soil and club moss, all of which regenerate the soil and improve forage. Despite benefits for both rancher and cow, low-stress livestock handling in its purest form is rarely practiced. Hibbard estimates that only about 2 percent of American cattle ranchers truly incorporate it, though many more claim to. It’s hard to convince ranchers who are used to thinking of their cows as so many widgets to treat them as sentient beings, says Hibbard. But when ranchers are willing to patiently practice with their cattle, they can teach mother cows to regain the maternal instinct that the cattle industry has worked so hard to breed out of them, preferring docile mommas who won’t charge when a rancher tries to approach her baby. At the Anderson ranch, they’re trying to put the fight back into their animals: They’ll cull a cow rather than breed her again if she doesn’t show aggression on her calf’s behalf. Down the road from the Anderson ranch, at the B-Bar ranch, they raise Ancient White Park cattle — a rare heritage breed where both sexes have horns and mothers are famously protective, with a reputation for charging grizzlies. This gives the herd a better chance of besting predators. If many ranchers are agnostic about their cattle, it’s certainly not easy to get a predator-hating cowboy to care about grizzlies. You can’t preach ranchers into compliance, says Martha Sellers, director of development and communication at People and Carnivores, a nonprofit that partners with ranchers in Montana and Wyoming to implement coexistence strategies, from cow composting sites (so that carcasses don’t draw predators closer to the herd) to fladry (electric fences tied with pieces of cloth that spook wolves), all of which have shown success. “The best way to get this stuff to work is to let neighbors talk to each other,” Sellers says. “Instead of us telling someone how it went, let their neighbor tell them” after they have zero depredations that year. Attitude is a barrier, but so is money. Attitude is a barrier, but so is money. Range riding, for example, means another salary to budget for. Even in Tom Miner, where several landowners are absentee millionaires, range riders are paid for by outside non-governmental organizations and government grants, though Anderson-Ramirez hopes the community’s ranchers will eventually be willing to fund at least some of the program themselves. And range riding isn’t practical for every locale. In dry places like Nevada, where the ranches are vast and arid, it would take too long to ride out to the herd every day. 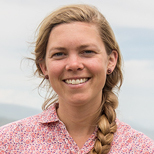 Still, Abby Nelson, a wolf management specialist with Montana Fish, Wildlife & Parks who has worked closely with the basin’s range riders, believes the case for range riding is strong, even if research on its efficacy remains scant. Since the program started in Tom Miner in 2013, there has only been one probable wolf kill. And while the same isn’t true for bear attacks, Nelson argues that range riding has many benefits besides deterring predations. 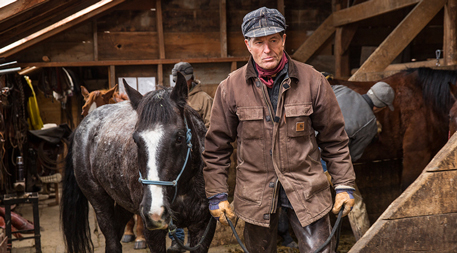 For one, riders are quick to the scene if a calf is sick or a cow is dead. A fast response is crucial, since the only way for ranchers to get reimbursed for a predator kill is for Wildlife Services to conduct an autopsy, proving that the animal didn’t die from other causes. But most of the time, ranchers don’t come across a carcass for days or even weeks, when it’s too deteriorated to tell what happened. Yet, if you listen to Anderson-Ramirez describe why she works to foster coexistence, something beyond the practical reasons, something verging on the sacred, emerges. She talks of the magic that you find— the wolf dens, the grizzly tracks — when you stop trying to rule the landscape, and instead let it teach you. On the dry plains area I wonder if there is value in and use for camera operated drones? how does one sign up to be a range rider? I am nearing retirement from my 37 year career as a UPS driver and would like to look into this line of work. I come from a ranching family, my grandparents homesteaded a dairy ranch in Klamath Falls Oregon nearly a 100 years ago that is still in operation. I am also a wildlife photographer in my spare time and have a great love for all wild critters and the land they need to survive. I have an understanding of the ranchers needs and motivations especially people like the ones mentioned in the story and know my way around cattle as I spent my youth running from and dodging angry cows protecting their calves. For those who may be interested in a part time job of range riding would be nice if there was a way to applying. Maybe a few government retirees may be interested also. Is there potential for ranchers to actually MAKE money off a range rider program (assuming the presence of humans is the deterrent, not some specific skillset)? Seems like a lot of people would pay good money to live an old style cowboy life for a week or two. It could be set up as a business, and then clients could be sent out to ranches with a portion of the fee paid to the rancher. That could incentivize more ranchers to participate in a program like this. I heartily applaud the innovative efforts of Ms. Anderson-Ramirez and a few other ranchers to see the “whole picture”. In general, western ranchers have been riding roughshod over predator species for far too long. What a great opportunity for other ranchers to hop on board the coexistence train and shed the “predator hater” image which so many conservationists and environmentalists have come to despise. Thanks for this hopeful, uplifting article. For those interested in range riding jobs and certifications, feel free to contact us through the Tom Miner Basin Association. There are options and information for those who would like to investigate further. Thank you for this amazing article full of insights on co-existence with top predators. I am a wildlife artist and love to help advocate the good work of conservation initiatives in Montana. It bewilders me that only a small hand-full of ranchers are willing to put in the effort to change practices that would be much better for their bottom line, safety and the predator. Thank you for showing a way that would create a healthier planet for all! I LOVE the grizzly bear, as an artist, I am inspired by its magnificent strength and beauty and I feel grateful the grizzly was made to be a resourceful species. I hope future generations of artists will also have the privilege to paint this majestic creature in its wild habitat! Thank you! This is so wonderful! Bravo to those involved. Hopefully more ranchers will be interested as it seems like a win-win situation.